The Vietnamese government has many times vowed to boost the equitisation of state-owned enterprises (SOEs), but the process has remained sluggish. The Central Institute of Economic Management frankly pointed out that interest groups are among the reasons for the sluggish pace of SOE economic restructuring between 2016 and 2020 in a recent report. Former Industry and Trade Minister Vu Huy Hoang (right) and his son Vu Quang Hai. Hoang promoted his son Sabeco leader despite Petrovietnam Finance Investment racking up losses of VND220 billion (USD10 million) between 2011 and 2012 under Vu Quang Hai. "It is the close relationship between companies and state officials that has affected the equitisation process and the link has still been maintained even when SOEs are equitised," the report said. In early 2014, former prime minister Nguyen Tan Dung ordered drastic measures to be taken to complete the equitisation of 415 SOEs within the year. The government leader said that state agency leaders, chairpersons of the provincial and municipal people's committees and heads of economic groups must be held accountable for the outcomes of restructuring, equitisation and divestment of SOEs under their management. Anyone who failed would be strictly disciplined. By the end of 2015, around 70 SOEs were equitised and since then the plan has seemed to have slowed. No state agency or economic group leaders have been punished for equitisation failures. This can be seen in many big SOEs, including Saigon Alcohol Beer and Beverages Corporation, Hanoi Alcohol Beer and Beverages Corporation or some petroleum firms. 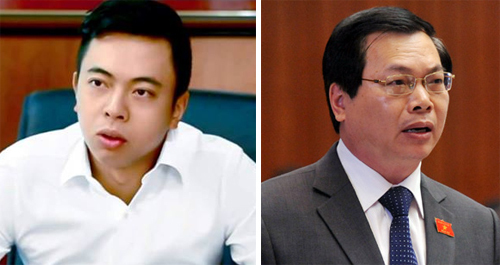 The relationship between former Industry and Trade Minister Vu Huy Hoang and his son Vu Quang Hai who was Sabeco deputy general director of Sabeco as well as other leaders of the firm have been said to have slowed down Sabeco’s equitisation. Former Minister of Industry and Trade Vu Huy Hoang promoted his son Vu Quang Hai for being Sabeco leader despite Petrovietnam Finance Investment racking up losses of VND220 billion (USD10 million) between 2011 and 2012 under Vu Quang Hai. The Vietnam Association of Financial Investors insisted that former Minister Vu Huy Hoang should be punished for his appointment of his son at Sabeco. The government has asked the Ministry of Industry and Trade to inspect the case. Even in some equitised companies, there are still regulations on majority rights of state ownership so that leaders continue to hold their seats and their interest groups. So, in some cases, it can be seen that leaders decide to lower their firms' share prices so that their relatives or those who they have close relations with can buy them for speculation. This has blocked opportunities for qualified people with good financial capacity from getting access to the management of Vietnamese SOEs. If the relationship between state officials and SOEs has been maintained for their interest groups, Vietnam's SOEs will continue lagging.